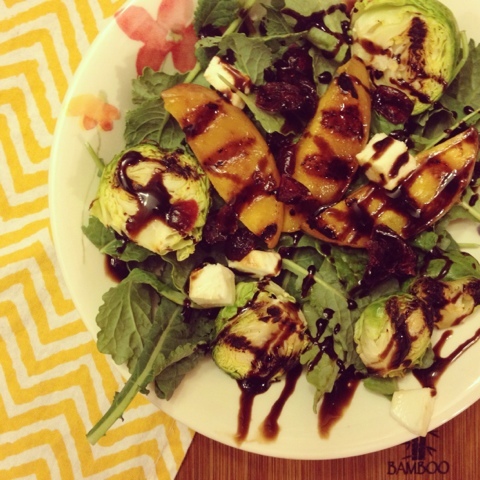 We could snack on grilled peaches drizzled with balsamic all day. Today we are whipping up a super quick and healthy lunch involving the two. Believe us when we tell you these two flavors were meant to come together! We start this salad by firing up the trusty grill pan! We grilled up sliced peaches and brussels sprouts to a nice, crispy brown. We piled our grilled fruit and veggies over a bed of fresh baby kale. Let us just say we are loving organic baby kale. If you have tried and failed at loving kale, then try this... it's much more delicate and enjoyable! We topped our salad with fresh mozzarella and dried cranberries. Yum and Yum. Last, but not least we drizzled over balsamic glaze. This salad was so fresh and delicious you really need to try it for yourself! 1. Slice peach into thin strips. Slice Brussels sprouts in half. 2. Add 1 tbsp. olive oil to grill pan. Grill peaches and Brussels sprouts for approx. 4 minutes - flipping halfway through. 3. Add 1/2 baby kale greens to each bowl. Add 1/2 cranberries, mozzarella, brussels sprouts and peaches. 4. Top each bowl with 1 tbsp. balsamic glaze.